『월인석보』는『월인천강지곡』과『석보상절』을 합하여 세조 5년(1459)에 편찬한 불교대장경이다. 석보는 석가모니불의 년보 즉 그의 일대기라는 뜻이다. 조선 세종 28년(1446) 소헌왕후 심씨가 죽자 세종은 그의 명복을 빌기 위해 아들인 수양대군(후의 세조)에게 명하여 불교서적을 참고하여 한글로 번역하여 편찬한 것이 곧『석보상절』이다. 세종 29년(1447) 세종은『석보상절』을 읽고 각각 2구절에 따라 찬가를 지었는데 이것이 곧『월인천강지곡』이다.『월인석보』는 완질이 현재 전하지 않으므로 전권의 수량은 확인할 수 없다. 월인석보 권22(月印釋譜 卷二十二)는 세조 때 처음으로 간행된 본을 바탕으로, 복각하여 간행한 중간본이며, 1권 1책이다. 책의 크기는 가로 22.2㎝, 세로 32㎝정도이다. 간행된 때는 정확치 않지만 희방사, 갑사 무량굴 등에서 복각한 것과 비교하여 거의 비슷한 시기일 것으로 짐작되며, 임진왜란 이전의 것으로 추정된다. Worin seokbo (Episodes from the Life of Sakyamuni Buddha) is a great collection of two Buddhist Sutras, namely, Worin cheongangjigok (Songs of the Moon's Reflection on a Thousand Rivers) and Seokbo sangjeol (Episodes from the Life of Sakyamuni Buddha), which was published in 1459 (the fifth year of the reign of King Sejo of the Joseon Dynasty). Seokbo means ‘Buddha’s chronology or biography.’ Seokbo sangjeol (Episodes from the Life of Sakyamuni Buddha) was translated into Korean from the Buddhist works by Grand Prince Suyang (later to become King Sejo) and published in 1446 (the 28th year of the reign of King Sejong of the Joseon Dynasty) in order to pray for the repose of Queen Soheon’s soul. 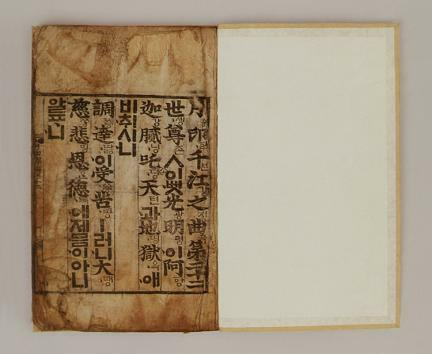 In 1447, King Sejong read Seokbo sangjeol and composed a paean to its every two lines, which are collectively named Worin cheongangjigok (Songs of the Moon's Reflection on a Thousand Rivers). As Worin seokbo has not been handed down to the present in a complete set, the original number of the volumes is unknown. 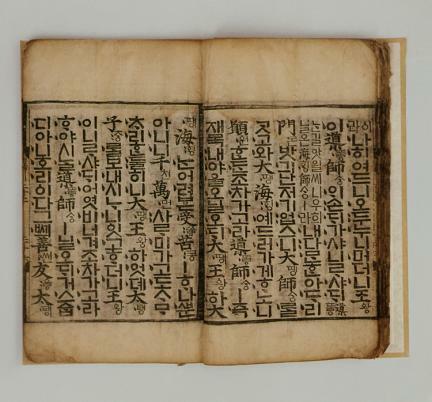 Volume 22 of Worin seokbo, bound as one book, was re-engraved based on the first edition published during the reign of King Sejo. The book measures 22.2 cm in width and 32 cm in length. 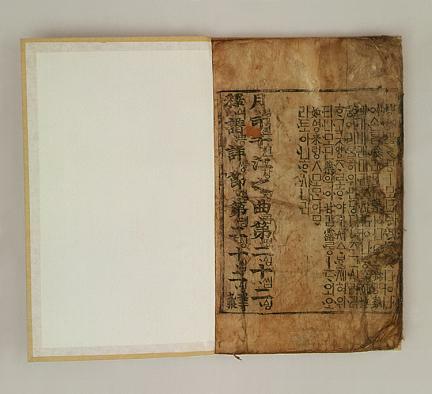 Although the exact date of its publication is unknown, it is assumed that it was published before the Japanese Invasion of Korea in 1592, around the same time that the editions of Huibangsa Temple and Muryanggul Cave of Gapsa Temple were produced.